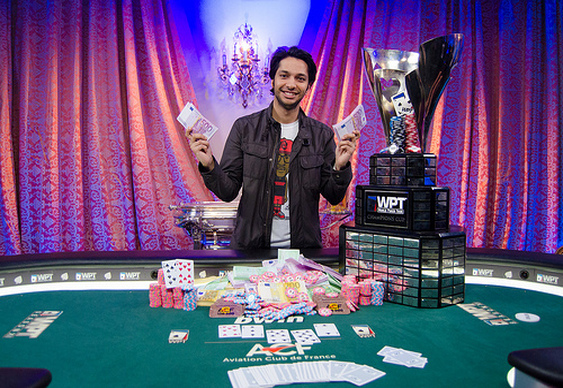 Mohsin Charaniamanaged a miracle comeback last night to claim this year's WPT Grand Prix de Paristitle and $469,477. At the start of the session it looked as though Vasili Firsauwas going to dominate proceedings owing to the fact he held more than 50% of the chips in play. That feeling was increased further when Firsau eliminated the first four players from the finale to take a sizeable chip lead into a heads-up battle with Charania. On one side of the room a small contingent of supporters were helping Firsau stare down Charania and a slew of pro players. Indeed, it seemed this support was enough spur Charania on to a monumental comeback which began with two double-ups within the space of 30 minutes. Despite breathing life back into his stack Charania's rough ride wasn't over yet as Firsau continued to push his way towards the title. Fortunately a slice of luck and a dash of determination eventually gave Charania a break and by the close of level 28 he managed to reverse his 7:1 chip disadvantage a take the lead. By the time level 29 rolled around it was Charania's time to shine after his pocket tens finally dispatched with a weary Firsau couldn't get his Ac Qs to connect with the 7h 7c 3s 8c 2c board. With that a rush of emotion (and friends) swamped Charania as he stood as added a WPT accolade to EPT Grand Final title he won back in 2012. Image courtesy of the WPT.